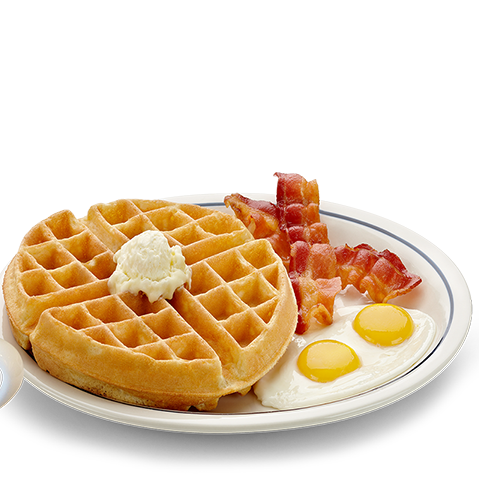 1728 Old Fort Pkwy, Murfreesboro, TN 37129 International House of Pancakes offers breakfast, lunch, and dinner favorites. 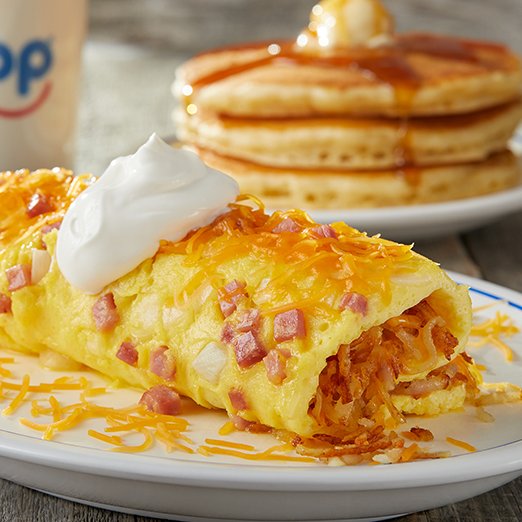 A delicious blend of ham,cheese,onions and hash browns. Topped with sour cream. Juicy grilled chicken breast, roasted red pepper & melted pepper jack, Montery & cheddar cheeses and spinach all tucked into a grilled flour tortilla — perfect for sharing. All our favorites. 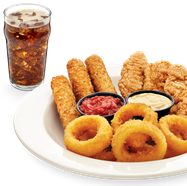 Monster Mozza Sticks,onion rings and crispy chicken strips. Served with marinara and choice of honey mustard or ranch. All white meat chicken strips,breaded and crispy-fried. Served with seasoned fries,garlic bread and honey mustard or ranch. A stack of four pancakes made with hearty grains, wholesome oats, almonds and English walnuts. Make it sweet with warm blueberry or cinnamon apple compote and whipped topping. Four rich chocolate batter pancakes filled with chocolate chips and topped with powdered sugar and whipped topping. Four buttermilk pancakes filled with blueberries,topped with warm blueberry compote and whipped topping. 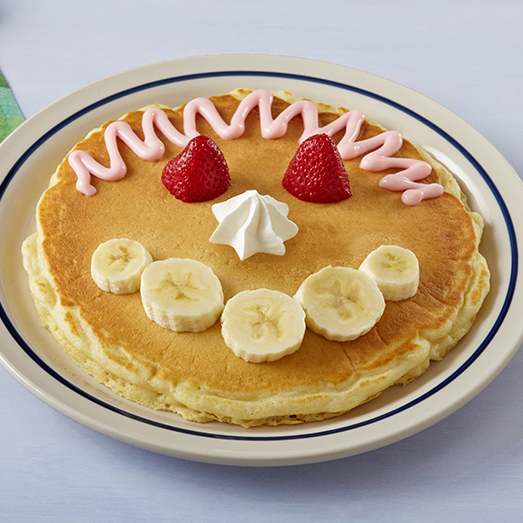 Four pancakes filled with slices of banana and crowned with cool strawberries,more banana slices and whipped topping. 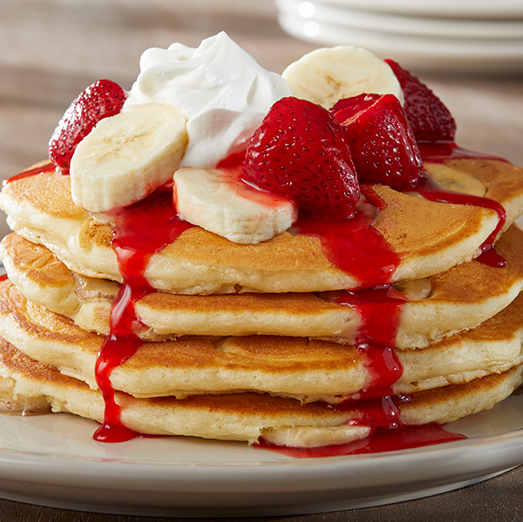 These signature pancakes are famous for a reason! Four of our thick buttermilk pancakes topped with your choice of peaches, cinnamon apple compote or glazed strawberries and finished with fluffy whipped topping. We pair up four all-white-meat golden chicken strips — breaded and crispy-fried — with four waffle quarters (topped with whipped butter!) for a one-of-a-kind meal. Dip your strips in honey mustard sauce, or your choice of dipping sauce. Bananas and Brioche will make you say, “oui oui” to this NEW breakfast anytime French Toast. The thick, rich brioche bread dipped in a lightly sweetened vanilla batter and grilled to golden perfection makes it extra special. The classic New Orleans Foster’s sauce is made from sliced bananas caramelized in a buttery brown sugar glaze. Then powdered sugar and whipped topping create the finishing touches! Four delicate crepes topped with Nutella. 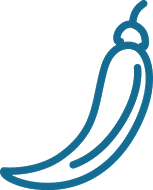 The original Hazelnut Spread and fresh sliced bananas. Two delicious crepes with sweet cream cheese filling. Topped with your choice of raspberry toppings or peach topping. Scrambled egg whites served with 2 slices of turkey bacon, seasonal fruit and whole wheat toast. Two eggs, hashbrowns, 4 bacon strips or 4 sausage links, and 2 buttermilk pancakes. Made with a splash of our famous buttermilk and wheat pancake batter. Fresh spinach,mushrooms,onion and Swiss. Topped with rich hollandaise and tomatoes. Loaded with six strips of crispy bacon,a rich cheese sauce,jack and cheddar cheeses and diced tomatoes. An abundance of fresh green peppers,mushrooms,onions,tomatoes,and cheddar cheese. Egg White omelette filled with fresh spinach, onion and Pepper Jack topped with fresh avocado & tomatoes. Served with seasonal fruit mixed fruit. Tender strips of steak,hash browns,green peppers,onions,mushrooms,tomatoes,and cheddar cheese. Served with salsa. A meat lovers delight. Bacon,pork sausage,shredded beef,ham,onions,green peppers and cheddar cheese. Served with salsa. 100% USDA Choice beef, hash browns, fresh tomatoes, onions, & American cheese. Topped with ketchup, mustard, and pickles. Build your own omelette. Served with your choice of cheese and add one filling. Fire Roasted Poblano peppers & onions, shredded beef, Jack and Cheddar cheese blend, fresh avocado, Poblano cream and spicy, chopped Serrano Peppers. 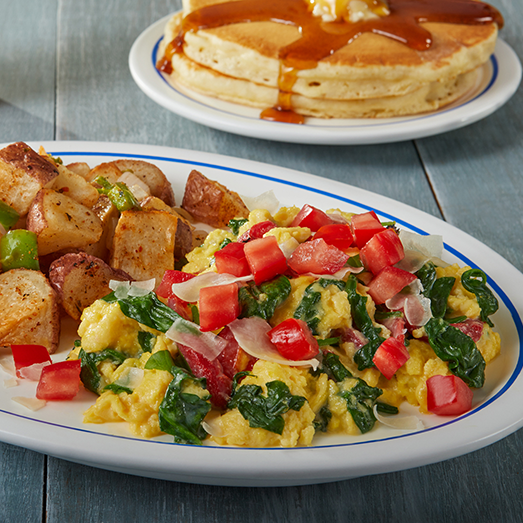 Scrambles eggs with Jack and Cheddar cheese, topped with our salsa and avocado. 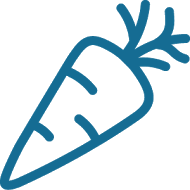 Served with red potato pepper and onion hash or hash browns, and side choice of a tortilla, toast or 2 buttermilk pancakes. All Burgers are served with choice of one side. 100% UDSA beef, white cheddar, sliced ham and an omelette made with green peppers and onions. American and grilled onions. Served on grilled marble rye. Hickory-smoked bacon, American, lettuce, tomato, and red onion. 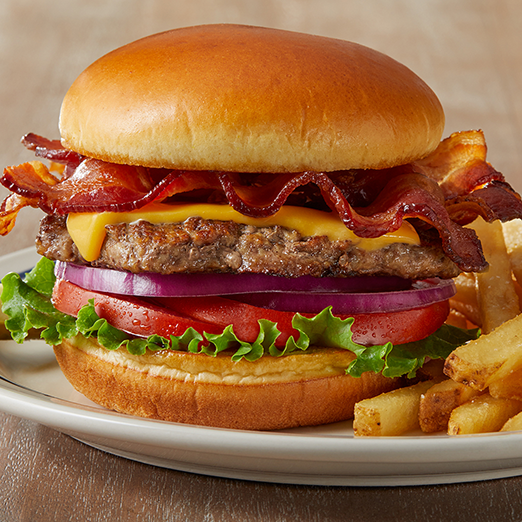 The all-American classic done your way with cheddar, lettuce, tomato & red onion on a toasted bun. All Burgers and Sandwiches are served with choice of one side. 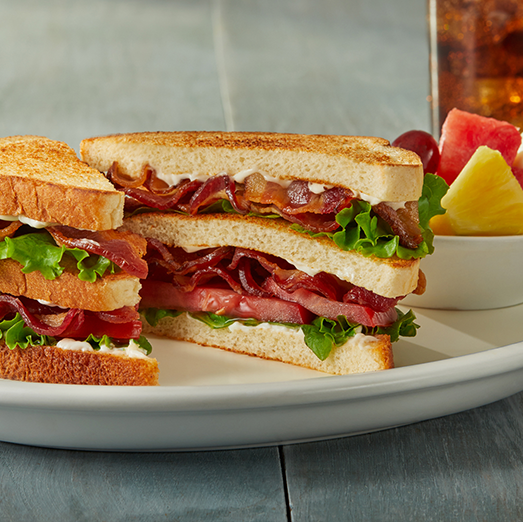 A great double-decker with six strips of crispy bacon,lettuce,tomato and mayonnaise on white toast. A crisp and juicy chicken breast tossed in our citrus chili sauce, topped with roasted Poblano & red bell peppers, sweet roasted onions, melted Pepper Jack cheese, crispy lettuce & our ranch dressing on a freshly grilled bun. Carved Roasted Turkey breast, avocado, hickory smoked bacon, tomatoes, mixed greens, red onions & ranch in a flour tortilla. From tender steaks to crispy fried chicken to twists on classic favorites like pot roast, our dinner menu has something for everyone. And every dinner comes with tasty garlic bread and your choice of soup or a side salad. A golden-battered beef steak smothered in country gravy. Served with mashed potatoes and steamed broccoli and garlic bread. Carved roasted turkey breast topped with warm gravy. 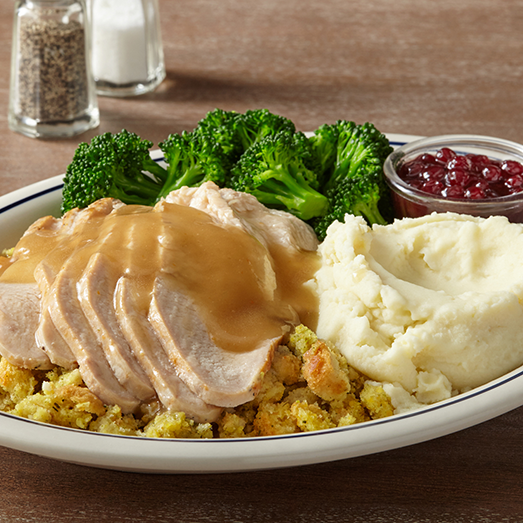 Served with cornbread stuffing, mashed potatoes, steamed fesh broccoli, a side of lingonberries and garlic bread. Two delicately seasoned tilapia filets, resting on a bed of spinach tossed in creamy Alfredo sauce and served with creamy mashed potatoes. Tender, slow-braised beef in a rich beef gravy. Served with mashed potatoes, whole kernel buttered corn & garlic bread. 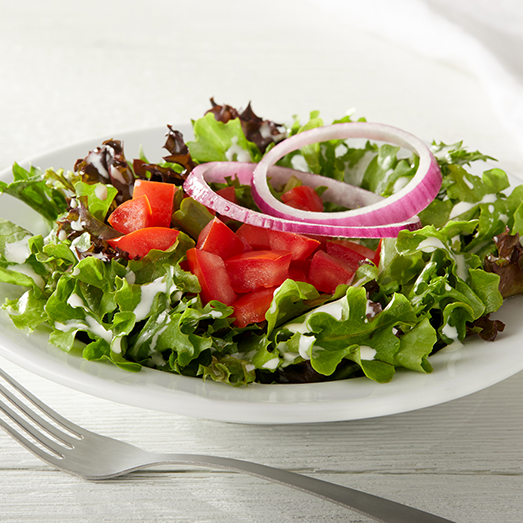 Grilled or crispy chicken, hickory smoked bacon, hard boiled egg, tomatoes and crumbled blue cheese on a bed of mixed greens tossed in buttermilk ranch. 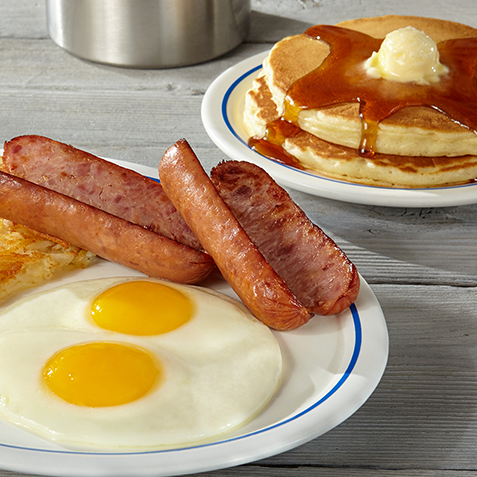 Our kids menu has great choices — for breakfast, lunch and dinner. 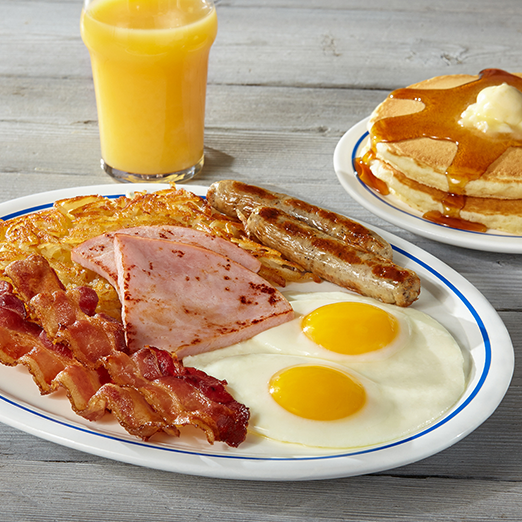 We even have kid-friendly meals that are just like what’s on the full IHOP menu. And they’re all under 600 calories. The perfect portion for little ones, these five silver dollar-sized buttermilk pancakes come with a scrambled egg and crispy bacon. One slice of Original French Toast topped with Nutella spread. Served with one scrambled egg. Four crispy chicken nuggets made with chicken breast and whole grains. Served with Motts Applesauce. Our cheesy and delicious KRAFT® Macaroni & Cheese is a great choice for lunch or dinner. Served with Mott's Applesauce. A blend of glazed strawberries, lemon-lime soda & premium orange juice.